Chrome-Plated Cement Filled Steel Bollard Post & Barriers. 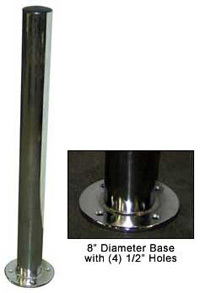 Improve the image of your facility while protecting people and equipment with this heavy-duty Chrome Bollard. Unit is made of steel and finished with an attractive bright chrome plating for a clean fresh look. A black plastic top cap is removable to fill the bollard with concrete for greater strength and stability. The mounting plate is pre-drilled with (4) 1/2" diameter holes for quick and easy installation. Base plate diameter is 8". Specs: height 42"; diameter 4"; base plate thickness 3/8".